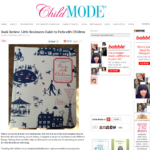 The virtual book tour for The Little Bookroom Guide to Paris with Children began yesterday with a Q & A with Lindsey Tramuta on her Lost in Cheeseland blog as part of her Franco File Fridays series! Tramuta is an American “who fell in love with a Frenchman and moved to Paris.” She discovers new trends in the city, covers not-so-cliché topics and writes about her experience living in the French capital. It’s some of the best and most expressive travel writing I’ve read. I’m appreciative of her support of my book. I’ll be posting details on my next tour stop tomorrow! Stay tuned for more! “The countdown to les grands vacances has begun. Soon, children will be on an extended holiday but before that can happen, their parents must scramble to find a place that is both kid-friendly and relatively entertaining for themselves. While Paris ranks high among travel destinations, its many paws-off pristine parks, bustling avenues and more adult dining options make it a less obvious choice.